In Yugoslavia or the territories where it people lived before, there were several attempts of creating VTOL flying machines. Some of them were studied only theoretically, but few were practically built or flight �tested. Among many of aeronautical designers in Yugoslavia there were several persons of Russian origin, that escaped from the Empire after the Revolution in October. One of them was Nikolai I Zuchenko, who acted as a designer, projecting aircraft or other aeronautical innovations. According to his work in this field in Yugoslavia, he deserved to be concerned as one of Yugoslav aviation pioneers. VTOL problem occupied Zuchenko so deeply that he worked hard to solve this matter accordingly. As result of this consideration, studies and his imagination, based on the treatment of all such projects ever initiated, he, during 1937, definitely ordered to the Supreme Air Force Headquarter gasturbine generator patent and project �an idea of vertical take �off aircraft. He also admitted that the project is based on his earlier projects already submitted and offered before. The scale test�model of such apparatus was examined and probed in proper laboratory. It occurred in the middle of July in 1937 and some lift force affected, promising that the equipment could be applied and mounted on a flying machine. Lifting force measured was found to be from 1,5 to 2,5 kg per horsepower. The Air Force decided to accept the design, under the influence of recommendation of their officials. The Commission, which found that the testing gave some promising results and confirmation of designer statement, encouraged Zuchenko to continue, providing initial and further support including certain sum of money. The designer reached instantly with his VTOL aircraft plans, named by himself Aerostatoplan. 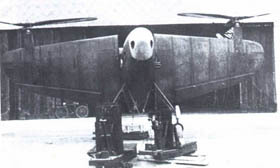 But nevertheless, because of many problems that aroused from the facts that it was a new concert with technical and technological problems of delicate system and unprobed principles of flight, the designer was forced to abandon the idea about turbine generator and two three �blade propellers were applied and installed instead �in the leading edge of the wing. Each wing �half could rotate around main wing strut. 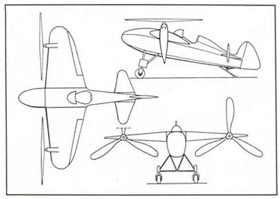 By this mean the aircraft achieved rotor �lift of helicopter or, by changing the angle of attack on the wing and propellers, to fly horizontally. 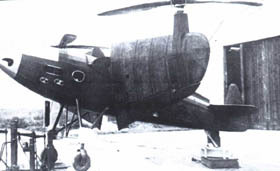 The engine was underpowered Walter Micron of 50hp (38 K W.) connected by complicated and rather weak system of transmission to propellers. 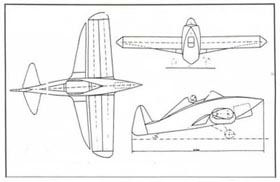 The �rest� of aircraft was similar to the standard airplane, including fuselage, lending gears, tail unit �except one �part adjusting vertical surface without any peculiar moving elevators. Weight was 355, and 425 kg total, calculated speed about 200 km/hour and estimated ceiling 5000 meters. The process off building was more deceased as it was expected. Expenses aroused and initial credit was well exhausted. By all means Zuchenko insisted to continue the project. After a hard work to obtain some money, the flying machine was close to be fish. Many changes in airframe, equipment and even in the structure and basic conception provoked additional expenses. The Supreme Air Force command gave up and Zuchenko paid all bills, undertook his own project and Aerostatoplan itself, almost (90%) finished. Definitely, during September of 1939, official presentation and test flight was attempted at the Novi Sad airfield. Test pilot was Zivoin DJ. Toracki. The tests included measuring of lift power of the rotor �propellers, flying ability and the functions of some devices and equipment. The results were not too devastating. But the weak engine, unusual transmission system, together with some further malfunctioning, left the Aerostatoplan grounded. The aircraft at almost full power wasn�t airborne. The engine roared, propellers wildly rotated but craft only trembled, shacked, twisted and acted just as wishing to take off �that never happened. The measured lift was well below required for the aircraft to lift her or to fly. By this the Air Force Supreme Command concluded its interest in the project. The final destiny of the project and the prototype is unknown and uncertain, while all traces were lost after the break of April War, 1941, in the chaos of short but violent struggles.